It happened again this morning – I told someone I get to school and back (North Sydney to Marconi, and back) using the bus. But my neighbour’s reaction got me thinking, why is it that in the CBRM the reaction to taking public transit is one of, well, horror? So I made a call to Bernie Steele, the supervisor for Transit Cape Breton. He’s a friendly man, and we had a nice chat about why exactly the transit system is the way it is, and why they can’t make changes at the moment. I got the feeling that Mr. Steele would make all kinds of changes, if only he was given the budget to do so. He filled me in on the history of the transit system, first. I guess that back before the whole municipality amalgamated, each town had their own transit system. 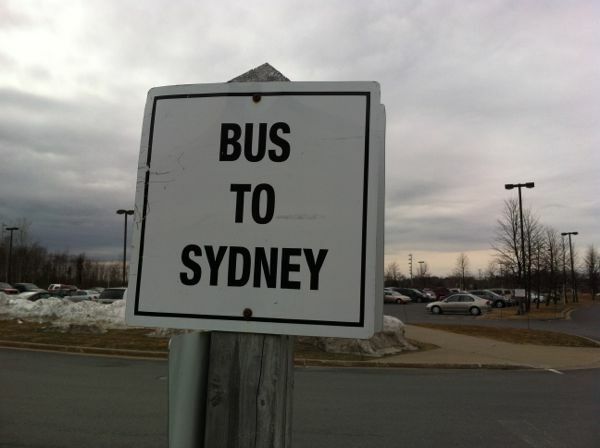 Glace Bay Transit, North Sydney Transit, etc. But then the towns amalgamated and became the Cape Breton Regional Municipality, or CBRM. Certain communities didn’t want transit (or at least that’s what their councillors said – I have a hard time believing that a whole community just wouldn’t want transit, at all). And then when the steel plant shut down, that was $2 million in tax revenue that the municipality lost, that helped pay for services like transit. And then the provincial government, no doubt under pressure to cut their own budget, cut the Transit Subsidy, in the 1990s. All of this meant much less money to the transit system. Less money means fewer drivers, less fuel money, and cuts had to be made. 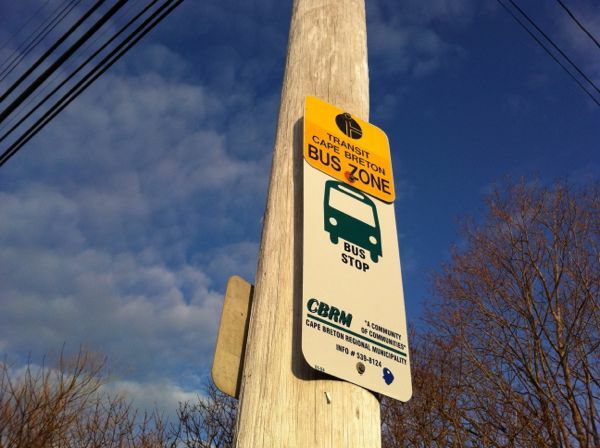 Mr. Steele told me that the CBRM hired a consultant to come in a few years ago and assess the transit system, and that the consultant recommended there should be more busses and more routes. The council unfortunately then rejected the consultant’s proposals, because they didn’t have the money for them. But now, Mr. Steele feels that there could be changes coming, with the new mayor, Cecil Clarke. You can contact mayor Cecil Clarke’s office by phoning (902) 563-5000, emailing cmmacintyre@cbrm.ns.ca or on Twitter: @MayorCBRM. You can email Bernie Steele at bmsteele@cbrm.ns.ca. 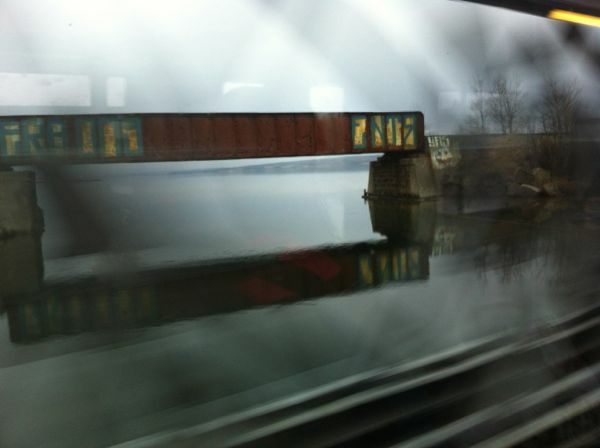 This entry was posted in Day to Day Life, Towns + communities and tagged Cape Breton Transit, Public transportation. Bookmark the permalink. Good for you. It seems to be a universal sentiment, however, that public transit is a great idea… FOR SOMEONE ELSE. i dont get it either why people seem to think so negitaivly about the buses around here. 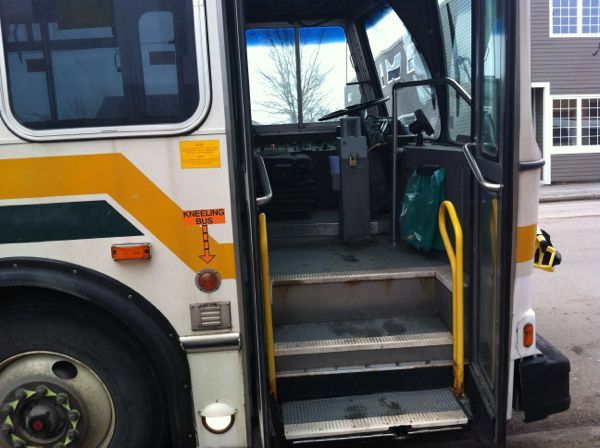 my spouse uses transit everyday to go to work , where he uses a company vehicle, then takes the bus home after work (has only a 40 min wait so loves to grab a coffee and wind down) , he saves us probably 40 – 50 bucks a week, makes a huge difference!!! My dad had a hellacious commute to work and back when we were kids. We lived in the northern ex-urbs of Minneapolis, and he drove back and forth to the international airport, about a 70 mile (112 km) round trip before the interstate highways shortened the trip slightly. He would often lament that he would take public transportation if it would get him to work by 7 am! Saves on gas. Allows people to talk on their phones. Sounds good to me. 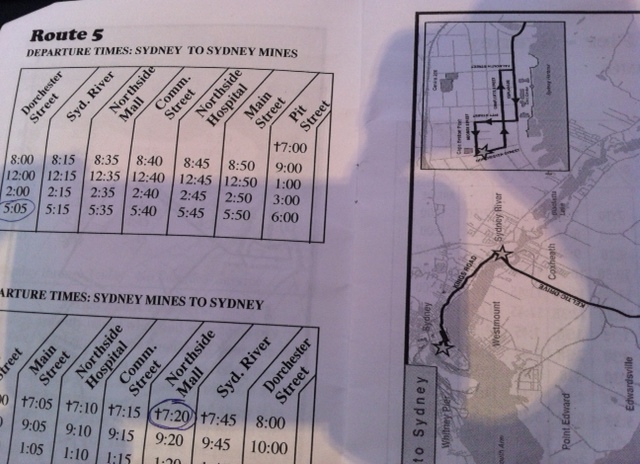 Does anyone know if there is a route from Westmount into Sydney? Considering the airport is behind Westmount and the Harbour in front I would think there is a transit route. Considering moving to the area and would appreciate any info you can give me. When you say Westmount, do you mean the community across the harbour from Sydney proper? My best advice is to check the Transit website (linked to from this post) or to call them up and ask. That’s the best bet. Thank you leah. I have already checked the transit to find that there never has been a transit link to Westmount, the community across the harbour from Sydney Proper. I was surprised at that since the Coast Guard College is just off Midgely Street and across Westmount road. The lady I spoke to at Transit was very helpful and she tells me there is a bridge out in that area which means driving around a different route for the next year and a half before expected completion. My main concern with transportation is having a few corner stores and gas stations within a short distance. Taking the long way into Sydney would not bother me in the least for a year or so. If you or anyone knows of any businesses out that way (Westmount) or pharmacies etc, it would be helpful. We are great believers in transit and want to buy where it is available for both my husband and I, even though I do drive and have a vehicle, due to health reasons, he does not and prefers to walk. Thanks leah and anyone who can provide more info. into the area above, please keep contributing. There aren’t many businesses out in Westmount that I’m aware of. I think most of them are in Sydney River (the closest ones). If you are interested in more info I would contact the local councillor for the area (which I think you can find on the municipal website). Or if you run into trouble with that,email me (leahcnoble@gmail.com) and I’ll see what I can do to help.